A ball cat toy is an inexpensive, interactive toy that your cat will enjoy. In addition, cat balls and other interactive cat toys allow you to join in the fun. It is a perfect bonding opportunity. Interactive cat toys (especially ball toys) make great gifts for the cats of all your cat loving friends. Below, you will find information about the different types of cat ball toys that are available in the pet market. You will also find several gift ideas. -- Interactive ball toys – My cats love battery-operated balls. The advantage of these types of toys is that they provide your cat with both entertainment and with the opportunity to exercise at the same time. The PetQwerks Talking Babble Ball is one example of the many alternatives you will find. -- Catnip filled ball toy – Cats love catnip. They get excited when they chew it or rub in it. A ball toy filled with catnip will surely delight them. The YEOWWW! Organic Catnip Balls makes a great choice. It is filled with 100% organic catnip. -- Noisy balls – Cats are attracted to noises. Certainly, a noisy ball toy will catch your cat’s attention. These ball toys are similar to rattles; usually, they come with jingle bells inside. The Our Pet's Play-N-Squeak Twinkle Ball of Furry Fury is an expamle of such a toy. It will keep your cat entertained for hours on end. -- Combined ball toys - You can find ball toys, like the Pong Pack Cat Toy: Feather Pong & Fur Pong From Da Bird , that come with feathers and rattles attached. Kitty will have lots of fun with these toys! 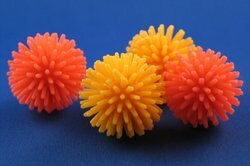 -- Treat balls - These fun toys are a cross between a ball toy and a treat dispenser. PetSafe SlimCat Food Distributor Ball works both as a toy and as a food "distributor". Let kitty work for her food. -- Fuzzy yarn balls - Cats love yarn and they will absolutely love these types of balls. Some even come equipped with rattles. Go!Cat!Go! Darn Yarn Balls make an inexpensive choice. Each package comes with two balls. -- Paper balls – These are the least expensive and the easiest to make. Just take a piece of paper and squash it into a tight ball and start playing. -- Sock – Take an odd sock you no longer use and roll it up into a ball. There, you have an instant toy. -- Knitted balls – If you are crafty and know how to knit or crochet, make kitty an original knitted ball. -- Ping pong balls and tennis balls – These are not only inexpensive but they are easy to get. You may even have some lying around the house. For extra fun, give several ball toys! Do you have an old ball cat toy your kitty is bored with? Give it a new life by sprinkling or rubbing fresh catnip on it. A great idea is to buy refillable catnip balls . This way, you can always replace the old catnip with new and fresh catnip. Kitty will love his or her revamped toy. Plus, you will save yourself some money.